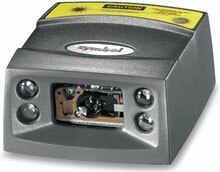 Symbol MS4407 - Imager, TTL, Serial and USB interface. Cable not included. See accessories. Captures barcodes in a variety of environments. Wherever a small footprint is required, the Symbol MS4400 delivers. One of the smallest CCD imaging products available today, this scanner excels at 1D and 2D barcode scanning, image capture and DPM reading. Attaining a new level of miniaturization, it can be used from the check-in kiosk to point-of-sale areas with limited counter space - or even integrated within clinical diagnostic equipment. Built-in omnidirectional capture and intuitive aiming ensures fast, accurate scanning, regardless of who is operating the device - your employees or your customers. The MS4400 fixed mount scanner is also available as a scan engine (SE4400), which allows for a smaller size and lower product costs. 3-year, comprehensive coverage, advanced exchange service (free overnight replacement) for your MS440X. Available only on new units. The Symbol MS-4407HD-I000R is also known as Symbol Technologies	SYM-MS4407HDI000R	or MS4407HDI000R	.